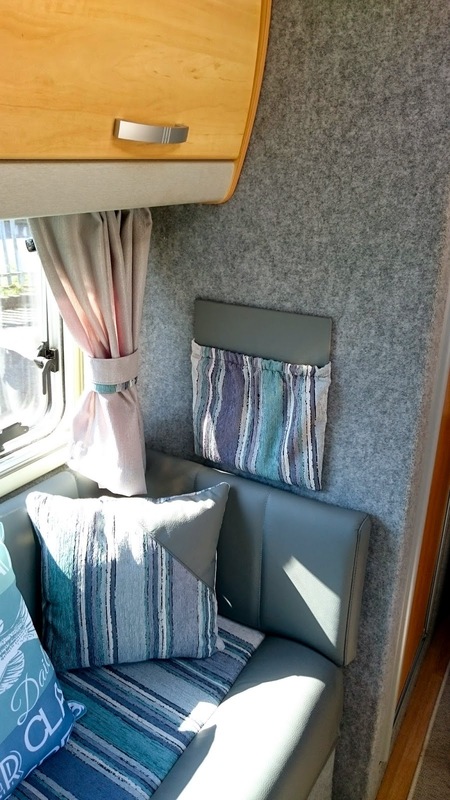 We'd previously arranged for Regal Furnishings to cover the cab seats plus make curtains and a bench cushion. 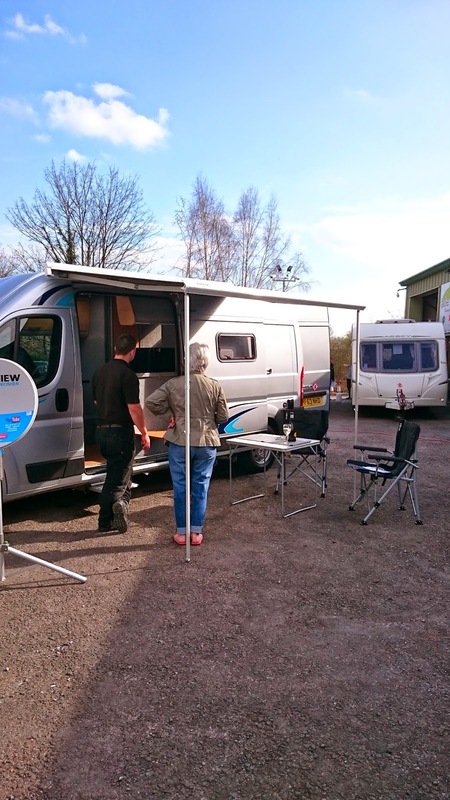 They're very popular as they do it all in a day at their workshop in Ilkeston, so we had to book 6 weeks in advance. 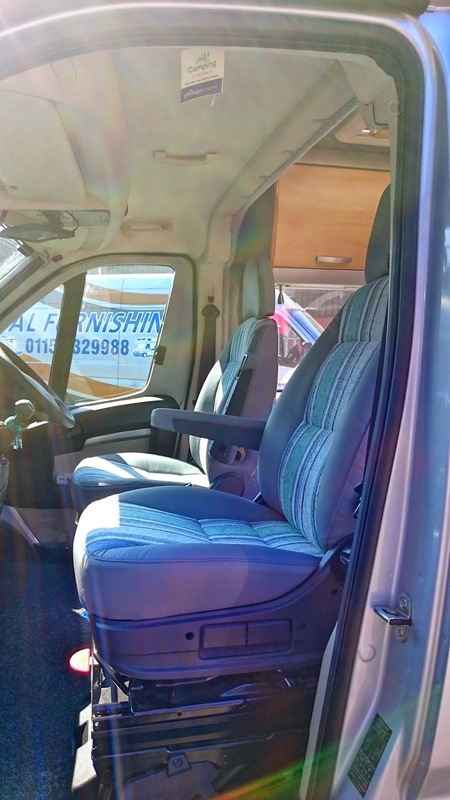 We also met them at the National Motorhome Show last weekend and chose the leather. We had also arranged to stay overnight locked in the yard on EHU, as they start work at 0700. Once home from work, we loaded up Cathy's car and drove up to the storage site. When all was loaded up and I'd topped up the fresh water, we headed off. Traffic wasn't too bad and we arrived at Regal at about 2015 (that's the time not the year!). 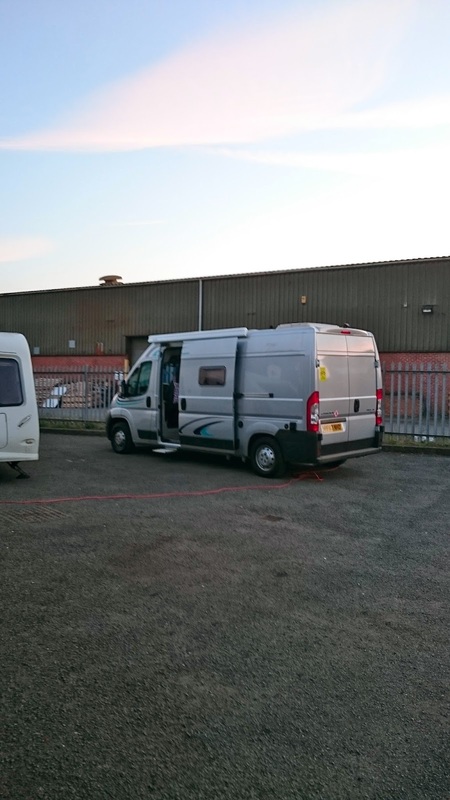 We were the only ones there and it seemed a bit strange to be sleeping on an industrial estate! But we were safely locked in and on electric hookup. We cooked sausages, onions and the first of the season's asparagus in the Remoska cooker, known as 'Oska'. Well fed and washed up we turned in. The alarm went off at 0600 and we got up,to a chilly, foggy morning. Breakfast was tea and toast and we put everything away, ready for the Regal team to turn up. There was a knock on the door at about 0715 and Mick came in to discuss our requirements. At the same time another guy was already unbolting the cab seats to take them out to be reupholstered and covered. We headed inside to see the 'Prussian Blue' (ie grey!) leather we had chosen and Cathy the chose the fabric to go with it (I'm colour blind - my job's not to choose, it's to pay!). After that she also chose the curtain fabric. 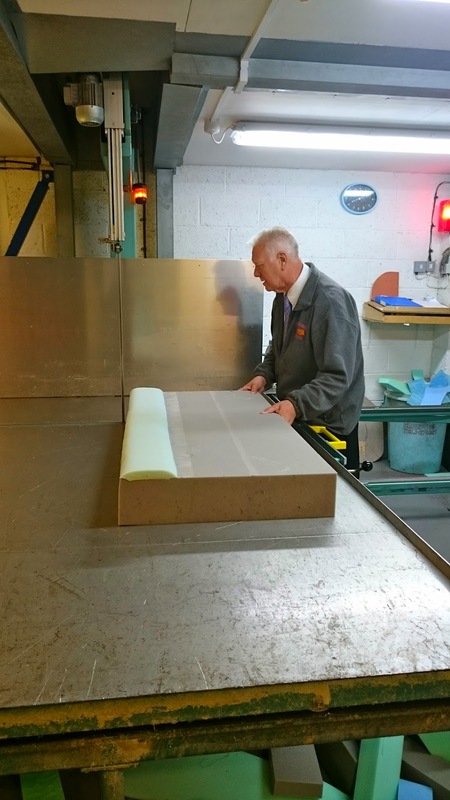 The Managing Director - Barry - is very hands-on and he took charge of making the bench cushion and backrests. 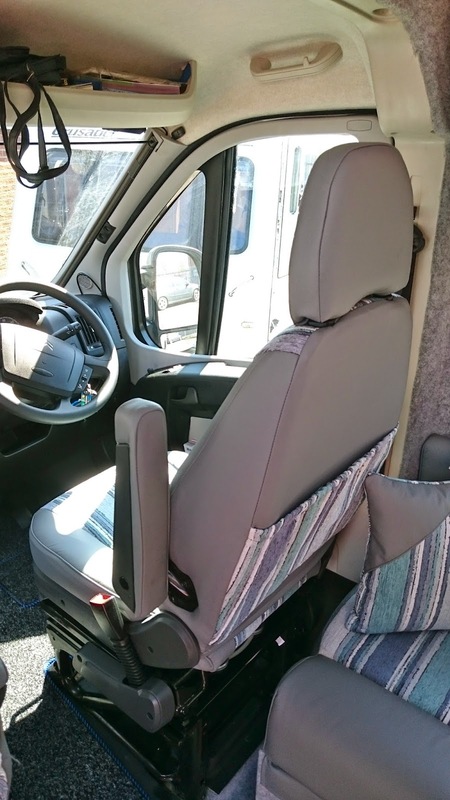 He identified how close the driver cab seat was to the bench and suggested a way to shape the cushion so that the cab seat didn't catch when swivelled - it worked for us. Once all was measured, agreed and sorted out, we sat in Reception until Mick dropped us off in Ilkeston. 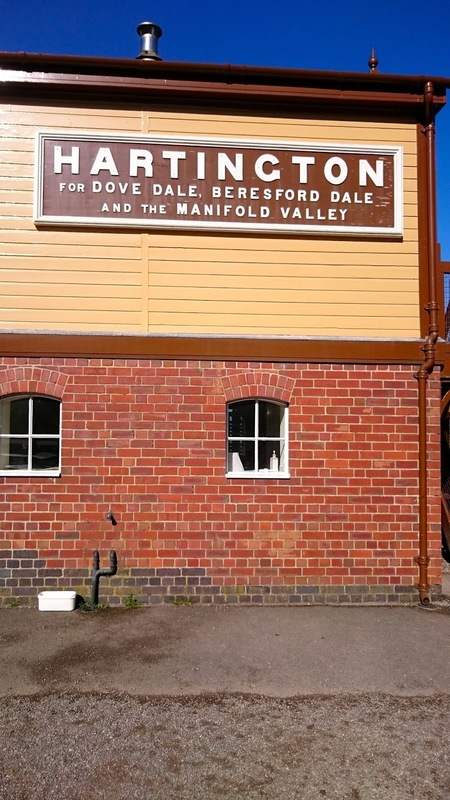 Ilkeston is a small market town which has suffered from the decline of local industry, but we managed to fill our day. After a drink in Costa, we popped into the shops for a few items, plus some lamb chops and sourdough bread. We also visited the free Erewash Museum in the town and particularly liked the old fashioned sweet shop - lots of memories in there! By now the fog had burned off and it was a warm, sunny day. We wandered around a little more before having lunch in Wetherspoons. At 1400 I called Mick and he picked us up. Back at Regals they were almost done and just needed to know where we wanted the 4 pouches they had made. Once that was done we were taken in to inspect the job. 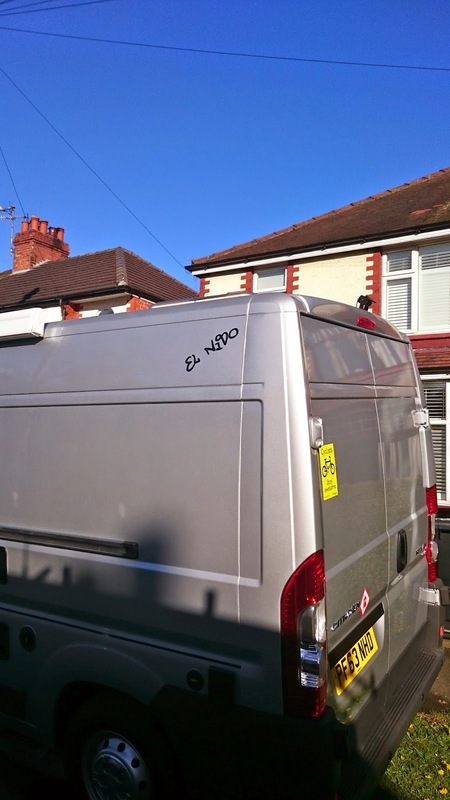 We were completely amazed by how Nido looked - completely transformed, like a new van. 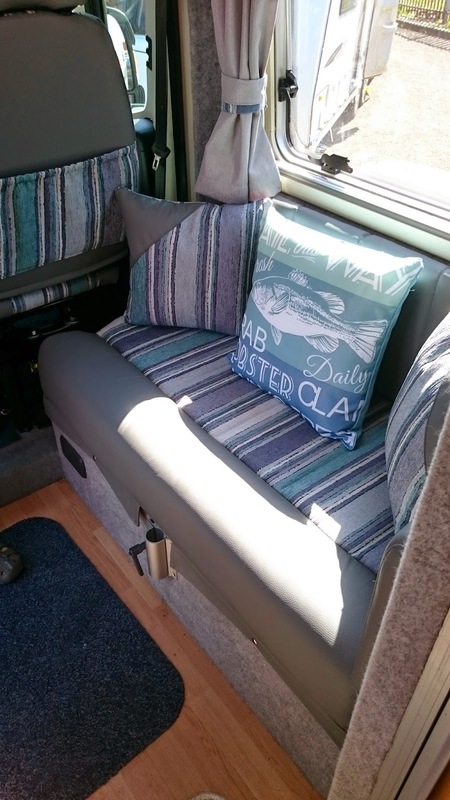 The quality is top-class and they had even made some matching cushions. 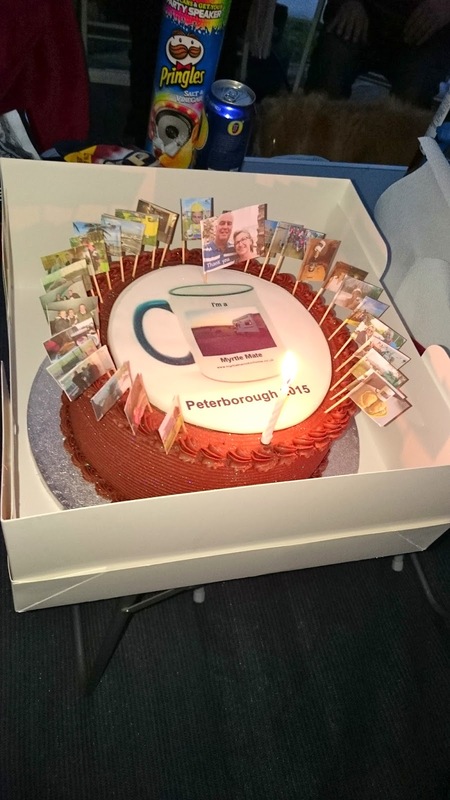 Regal are a small firm who focus on delighting their customer - we couldn't have been happier. There was a friendly, family buzz inside the workshop, with everyone knowing their role and quietly getting on with it. We can't recommend Regal highly enough. With Nido looking very smart inside, we headed off to our overnight stop at a Britstop. 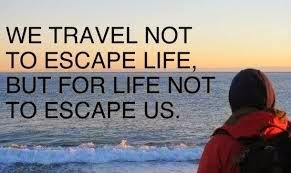 If you're not familiar with this concept, we paid an annual subscription and for that get a book of over 500 places to stay for free. 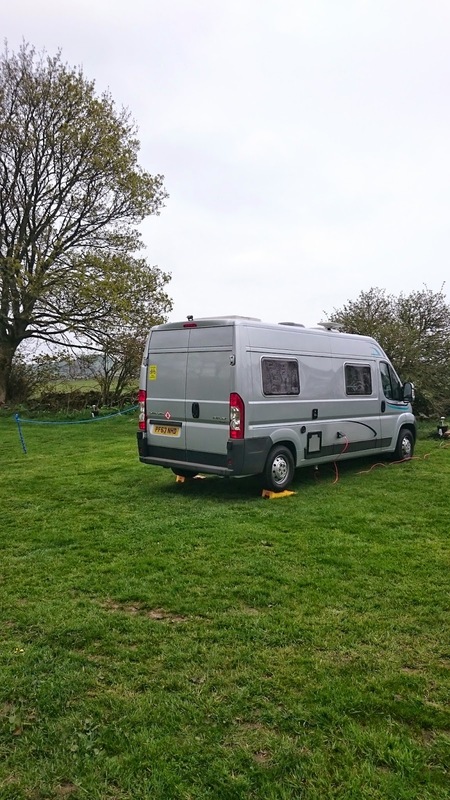 Many are pub car parks with none of the usual campsite facilities, but if self-sufficient (and we are) it's a great way to visit new places. There's no obligation to purchase anything from the host, but most do. Originally I had planned on staying at Britstop 522 but on the way decided on the spur of the moment to go to 523 instead. The stops are referred to by their number and not name and location. This is to ensure Britstops aren't abused by those who haven't joined. On arrival I parked us into the far corner of the car park, as requested in the book and popped in to let the landlord know we were there (no advance booking is needed). 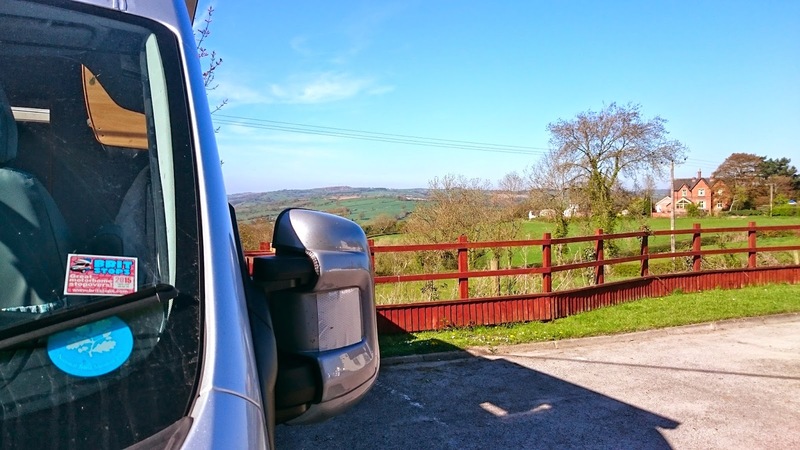 We had lovely views over the Derbyshire countryside and sat in the sunshine with a brew. 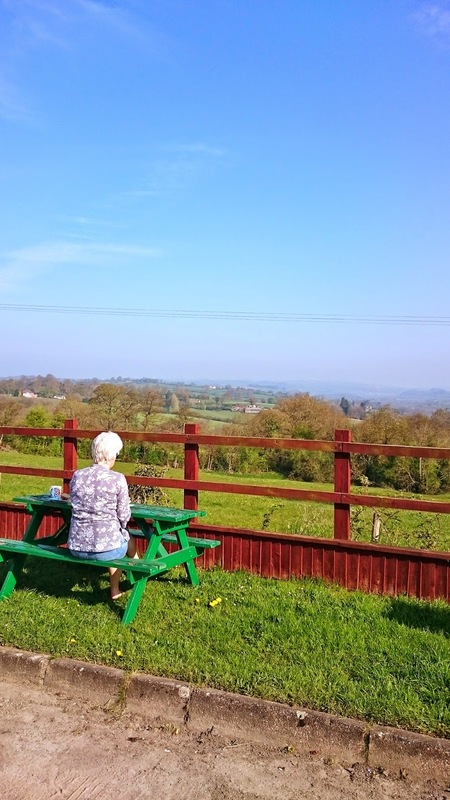 The pub had a lovely south-facing sundeck overlooking the valley, so we sat in warm sunshine and enjoyed a couple of drinks. 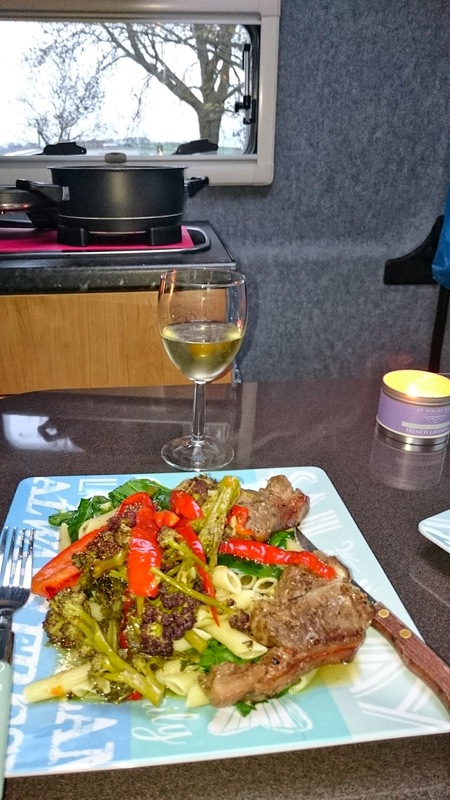 Back at the van I cooked chicken thighs with peppers, garlic, ginger and noodles - very tasty. Washing up done, Cathy headed off to bed to read while I wrote up my blog post for last weekend, before turning in myself. Tiglet with a birds-eye view! Chilled - and I don't mean the beer! We slept well. It was warmer last night, but this was helped by the curtain that now cordoned off the bedroom from the rest of the van. We had a lazy start; I had a brew the cooked bacon sarnies, which we enjoyed sat outside at one of the pub benches with a pot of tea. Washed up, cleared and and 'secured for sea' I popped into the pub to thank them for allowing us to stay (one of the few Britstop 'rules'). 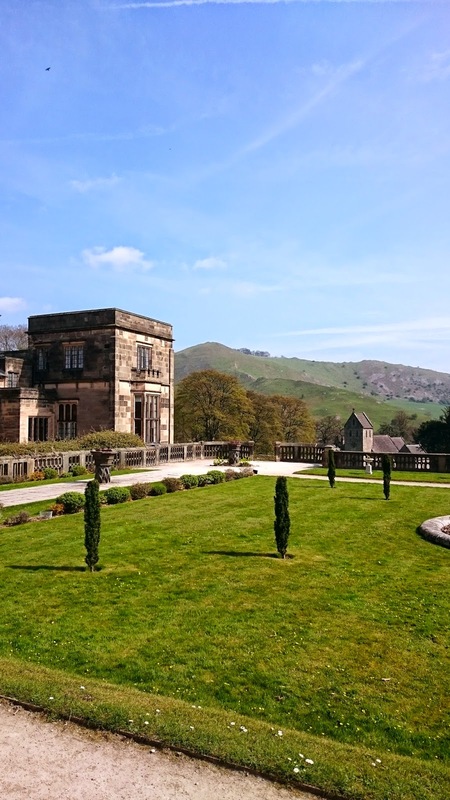 I'd also looked up and found a local National Trust house and gardens - Ilam Hall and country park. With the satnav coordinates set, it was only a short drive before we pulled into their car park. 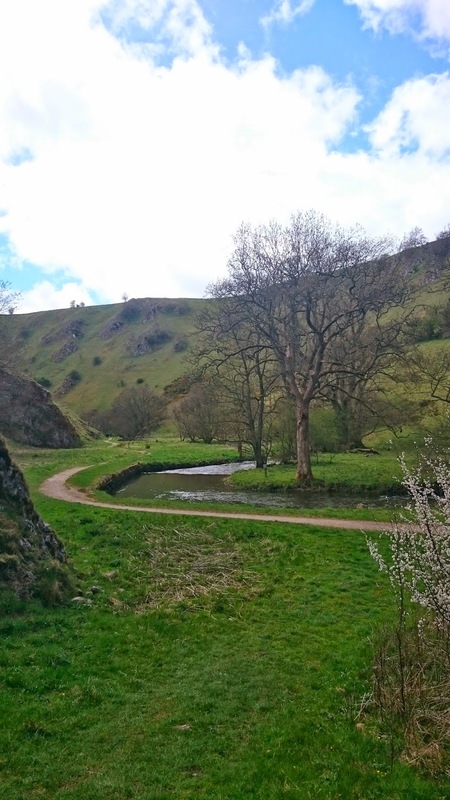 This located in the beautiful area of Dovedale, next to the Thorpe's Cloud hill and with lovely walks all around. 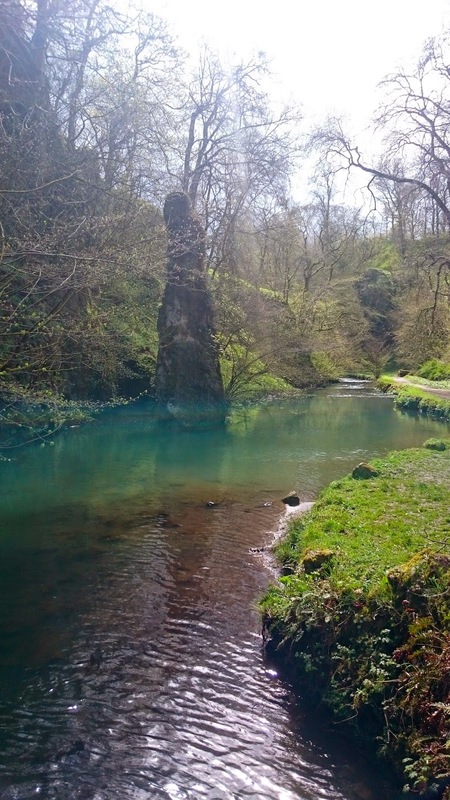 We also unexpectedly found a NT campsite next door, with all the usual facilities and reasonably priced - one for the future as the walks from here are amazing. 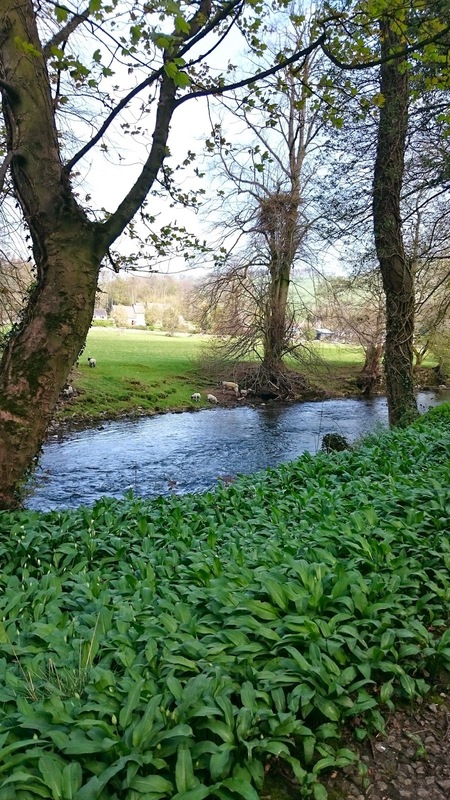 We walked around the grounds and had a look in the lovely little church, before walking alongside the river Dove, with masses of wild garlic. It was a still, warm, sunny spring day - beautiful, and all the better that most people were at work! 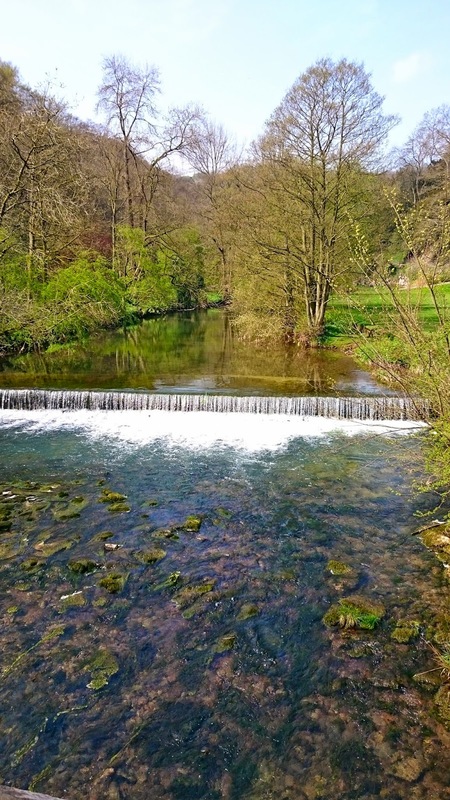 It was here that Izaak Walton did a lot of fishing and wrote his famous book 'The Compleat Angler'. 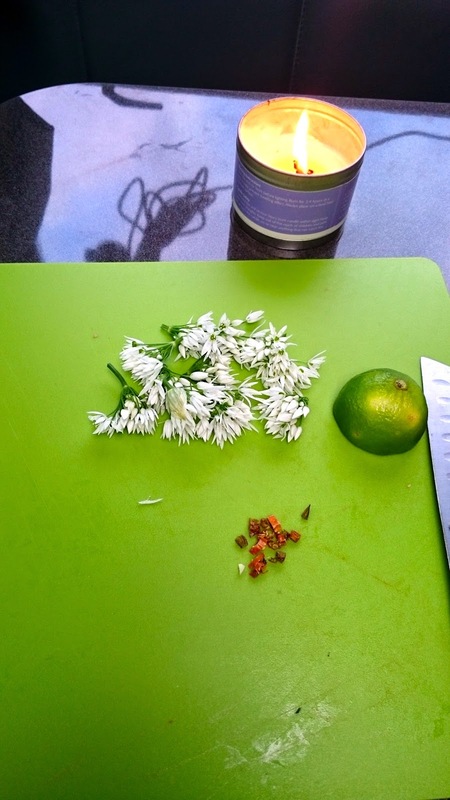 On the way back we picked some wild garlic flowers for tomorrow's salad. 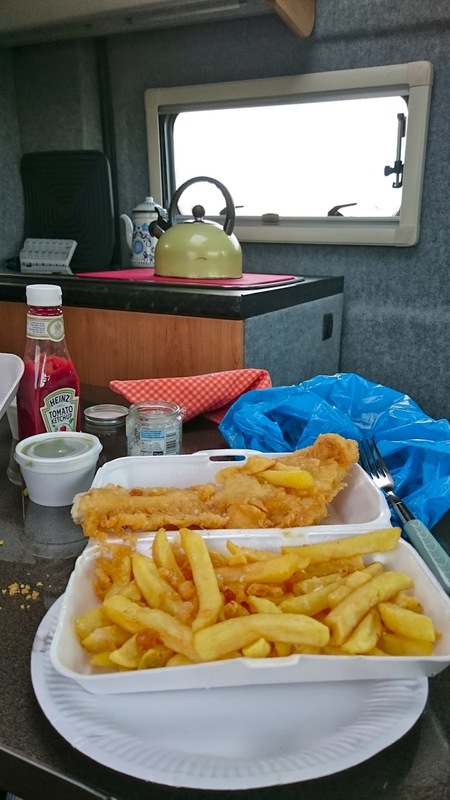 Back at the van, Cathy made lunch while I got out the chairs and small wooden table. 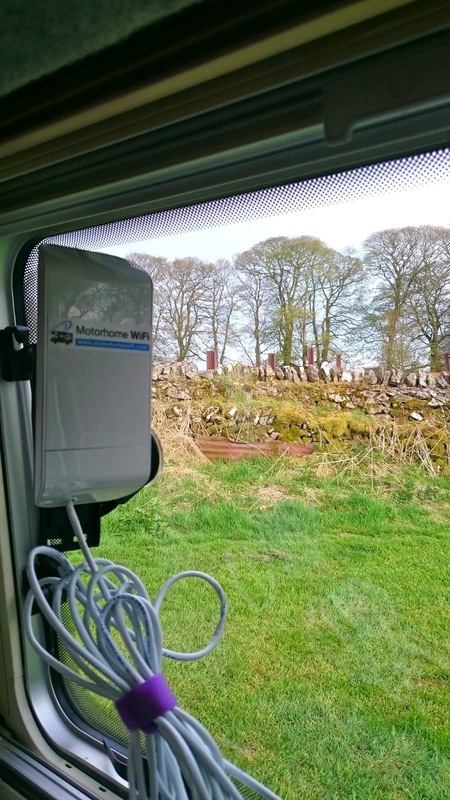 Back on the road, we made a short hop to our stop for the next 2 nights - Whitehouse Farm CL in Heathcote, near Hartington. 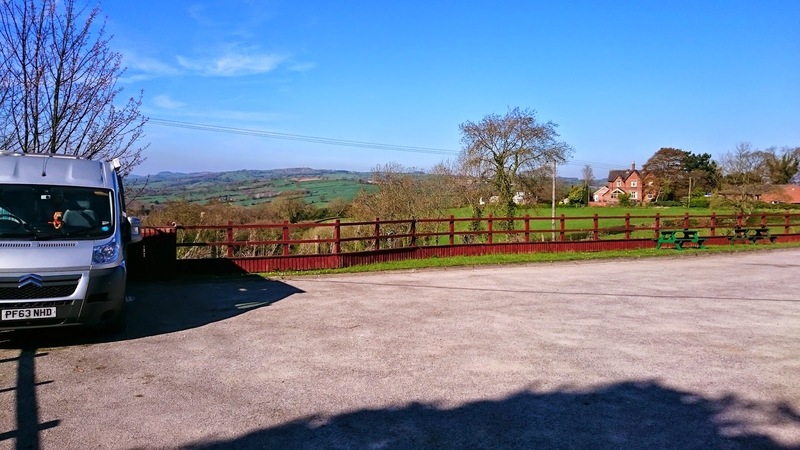 This 5 pitch CL was next to the owner' working farm with great views over dry-stone wall enclosed fields and hills - very peaceful. Cathy pottered inside and I went over to 'check-in' and say hello to the owners, who were very welcoming. 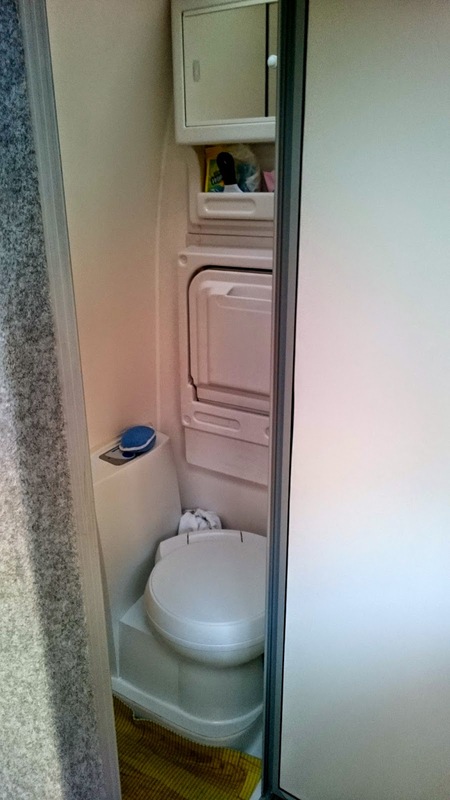 Back at the van, I emptied the toilet cassette and grey water. Before filling up with fresh, I filed down 'Nid', a grey waste pipe that I could fit into the fresh water filling point so I could easily fill up with a 10L container - this works a treat and means I won't need to use the hosepipe too often. Fresh tank full, I also filled the loo flush tank too and by then Cathy was done, had tidied the garage storage and had tea and coffee. We sat outside but by then it was windier, cooler and overcast, so we sat in the van. 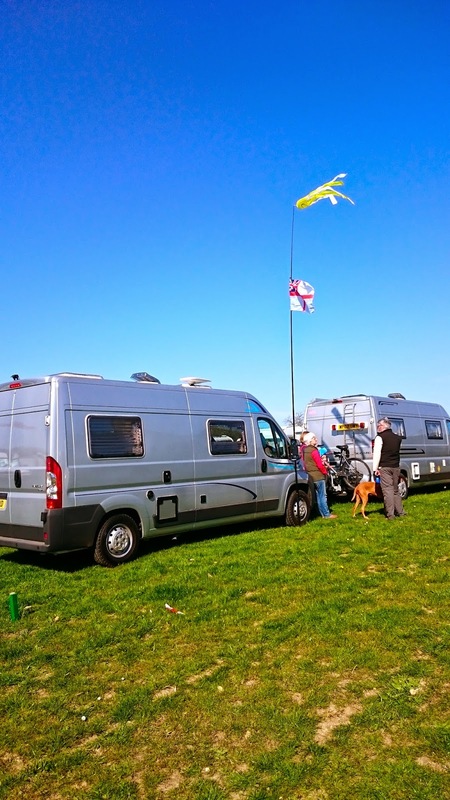 Some ex-Navy friends, Dave & Angie Walsh, are staying in their caravan nearby. 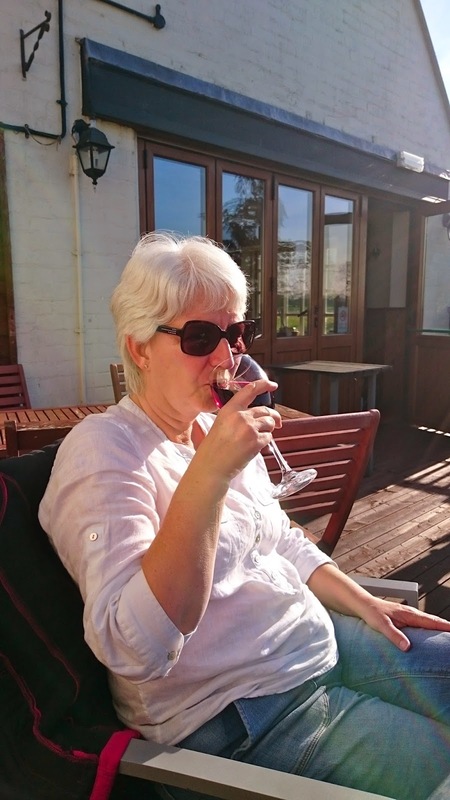 We'd already been in touch and Dave suggested booking a table at the Royal Oak in Hurdlow, to which we readily agreed! We both enjoyed piping hot showers and, changed and smelling clean again, we ready for them to pick us up in their car. True to form, as ex-matelots, Dave and Ange (plus Fudge the dog) arrived '5 minutes before'! It was good to see them again and they looked well, having spent the past few days walking the Peaks in good weather. Dave drove to the pub and he took Fudge for a quick walk while we piled in. 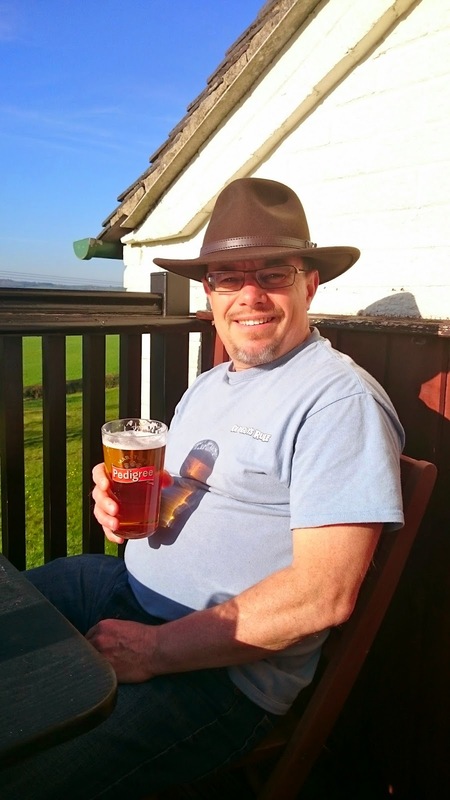 I could see Doom Bar was on tap, so 3 pints were ordered, except for Ange who as Duty Driver, was on soft drinks. The pub had a lovely atmosphere, buzzy but with no TVs or machines. We sat at our table and our waitress ran through the specials. Apparently pies are a speciality, so Dave and I had the pork and chicken pie, Ange had Fisherman's Pie (which included shell on prawns and scallops) and Cathy had salmon. We chatted away, catching up, until our food arrived, which soon shut us up! It was all very tasty, wholesome and filling. Mains done, Ange & Cathy ordered Banoffee Pie, which was large and rich; Dave and I had cheese - we could have easily shared one portion. At this point Fudge came in to join us and lay very patiently, nose twitching due to all the foodie smells - plus other dogs. It was an excellent meal in a friendly, country pub. Ange kindly drove us back through the pitch dark lanes and we said our goodbyes. 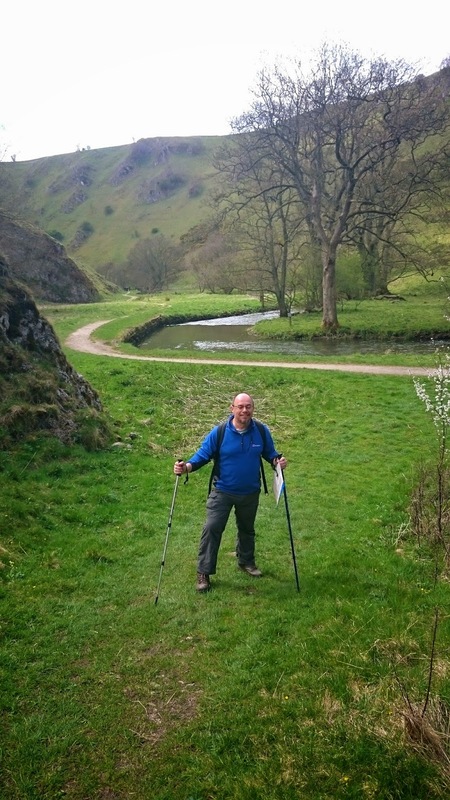 Good luck to all three of you as you soon head off to walk the Pennine Way. 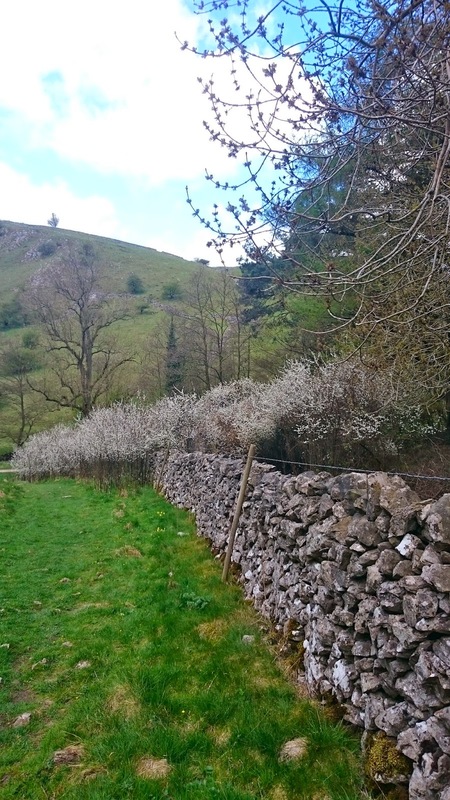 If you want to follow them and their walks - their website can be found here. It wasn't late and we were in bed reading by 2200. All was very dark and very quiet. We both slept very well - full 8 hours. There's a pattern emerging; despite the limited space we sleep much better in the van than at home. I made us a brew, Cathy had hers in bed while I sat on the bench looking at the view. Breakfast was poached eggs and the remaining sourdough bread toasted. Then I made our sandwiches - the usual tuna, onion and mayo - while Cathy sorted out a flask of tea. All washed up and stowed away, we headed off for our walk. 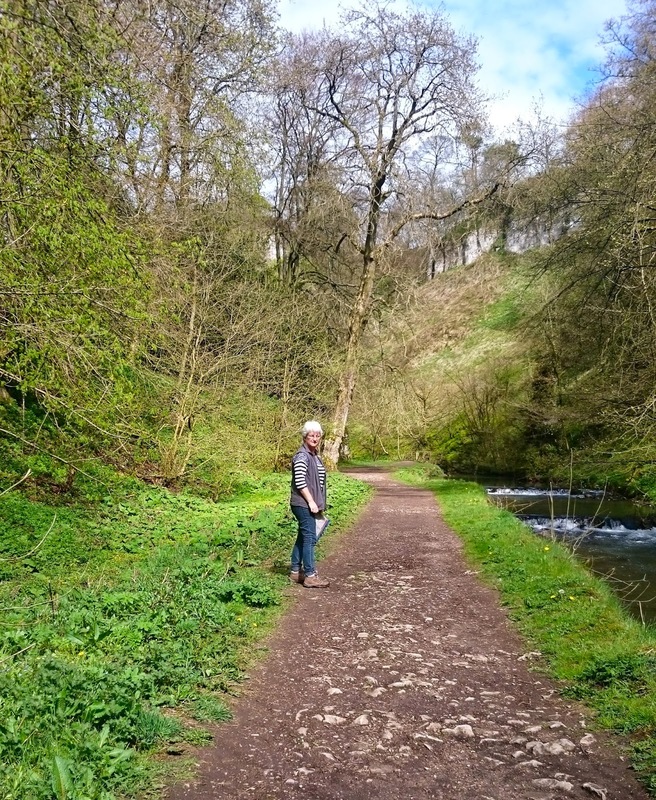 The first section took us through Biggin, then south on to the Tissington Trail, an old railway line. About 2.5 miles later we took a footpath down the hill into a valley, with a wood on our right and a steep slope on our left. 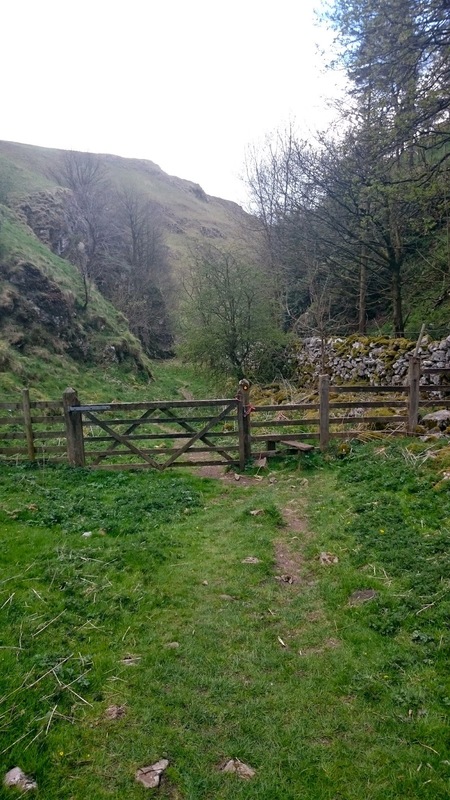 After about 1/2 mile we reached the River Dove and turned north to follow the river through the valley of Wolfscote Dale. It was sunny and warm and we were soon shedding layers. Further up we stopped to have lunch by the river, sat on a tree trunk. A while later the sky darkened, the wind increased and soon it was raining hard. I broke out the survival bag which sheltered us from the worst of the rain, although our trousers ended up very wet. 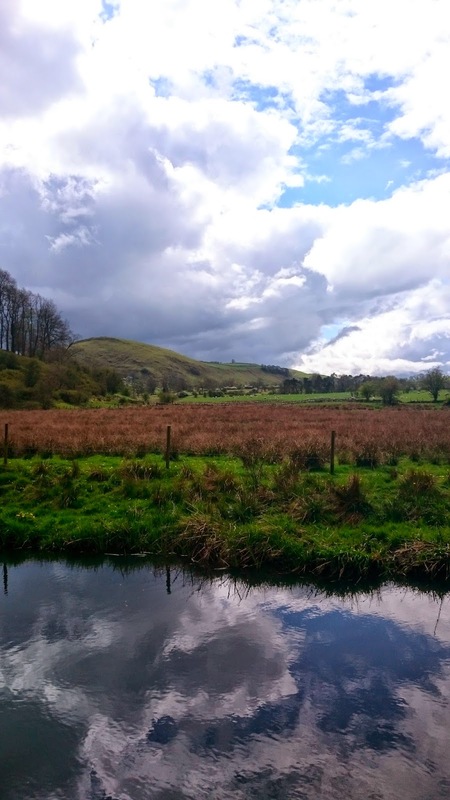 Back on the trail, we contined through sunshine and the occasional spots of rain, until we popped out of the end of the valley and walked into the village of Hartington. 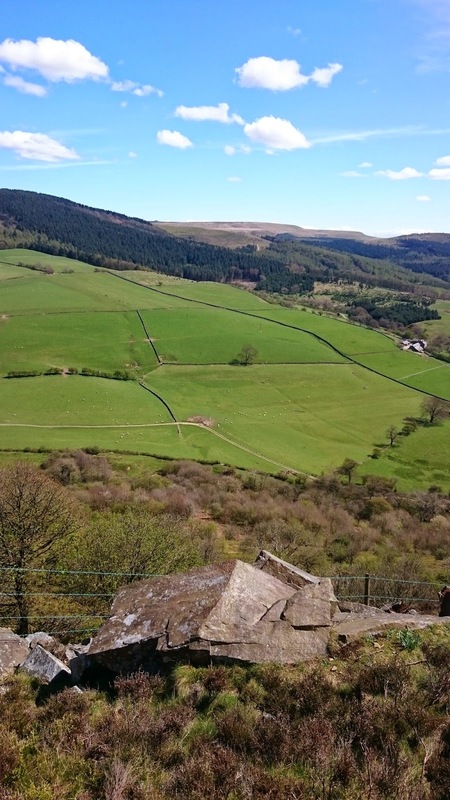 We stopped off to buy some milk, bread rolls and biscuits before walking back over the hill to Heathcote. 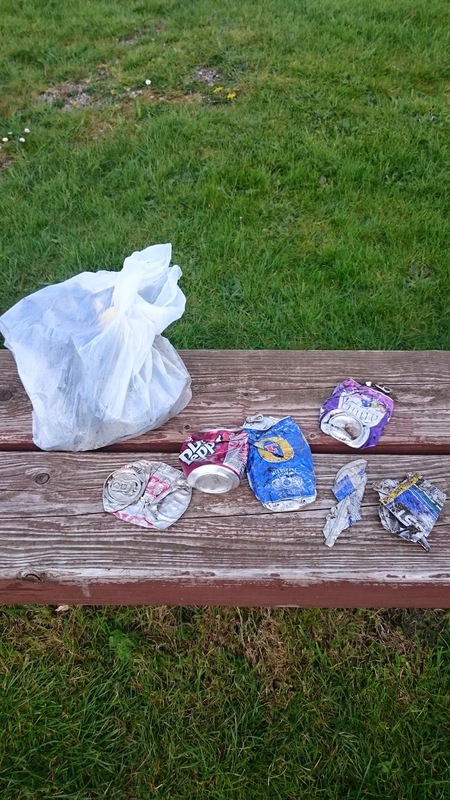 On the way Cathy picked up a load of litter to dispose of and tweet as part of her 'Litterati' campaign. 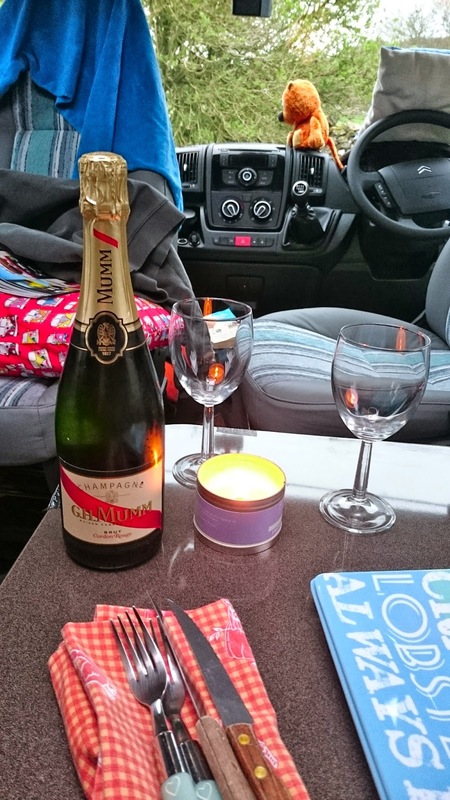 Back at the van, we drank some fizzy water & orange juice followed by a cup of tea. Cathy then had a snooze while I prepared dinner - lamb chops marinated in garlic, thyme, salt, pepper, orange juice and olive oil. This was accompanied by penne with wild garlic flowers, chilli and spinach. It was very filling and very tasty! We also enjoyed a bottle of champagne to celebrate our first solo trip in El Nido. 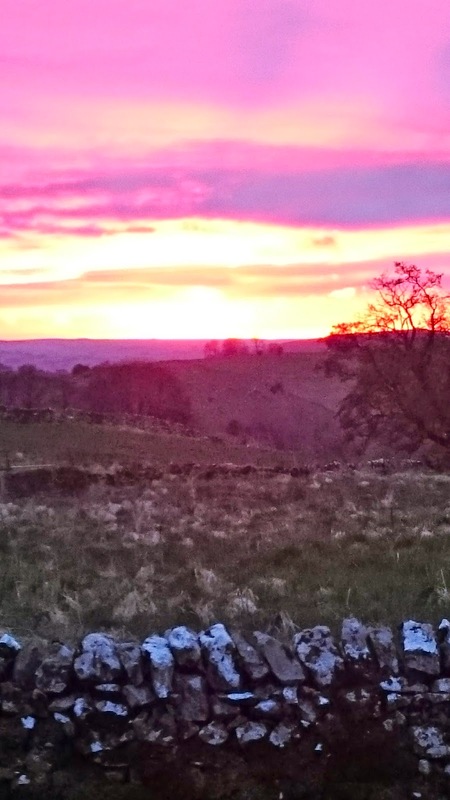 As we ate at our dining table, we watched a beautiful sunset over the hills and went out to take some photos - truly wonderful. Once the washing and clearing up was done, we crashed out again, tired but very content. 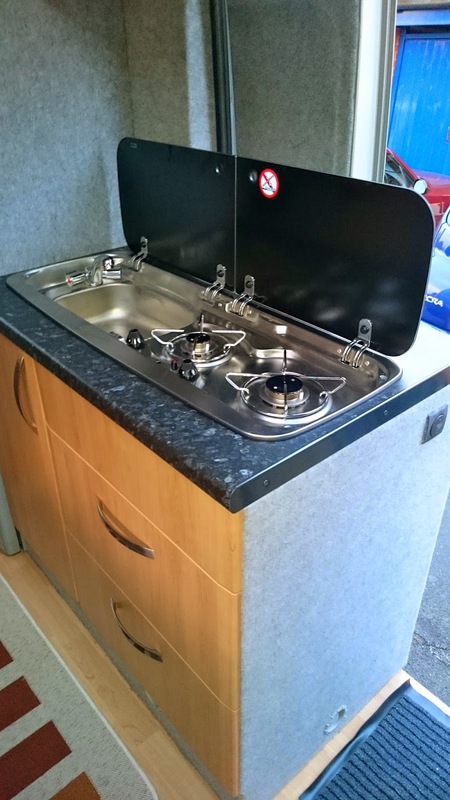 Who says you have to slum it in a campervan!? Is Tiglet after the champagne or the mug? It rained early in the night; I heard it but Cathy was fast asleep, unusual for her. We woke to blue skies, warm sunshine but a chilly breeze when in the shade. 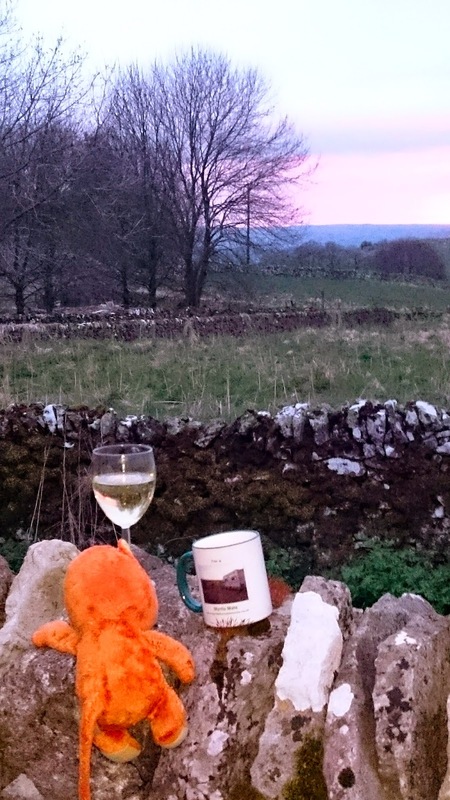 I got up and made us a brew, before we dressed and walked across the fields to pick up the other end of the Tissington Trail. 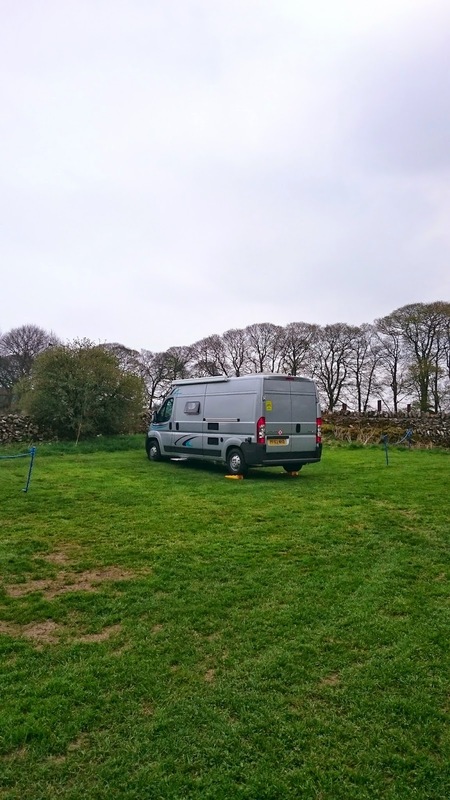 We came across the Hartington Station car park, £4.50 for all day parking with a water tap and toilets - a great day stop for the van. 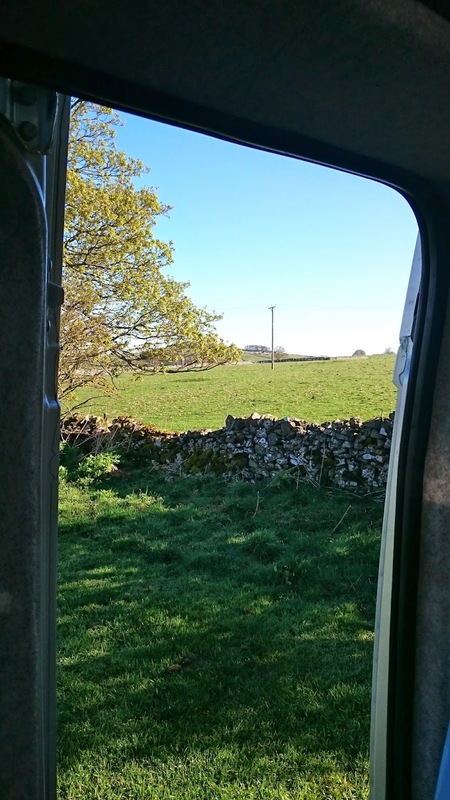 Reversing the route, we returned to the van and ate breakfast outside in the warm sunshine - bacon and scrambled egg rolls. The rest of the morning was taken up with sorting lockers and cupboards, plus the usual emptying of tanks, recycling rubbish and preparing to head off. We really enjoyed our two days at the Whitehouse Farm CL and highly recommend it. 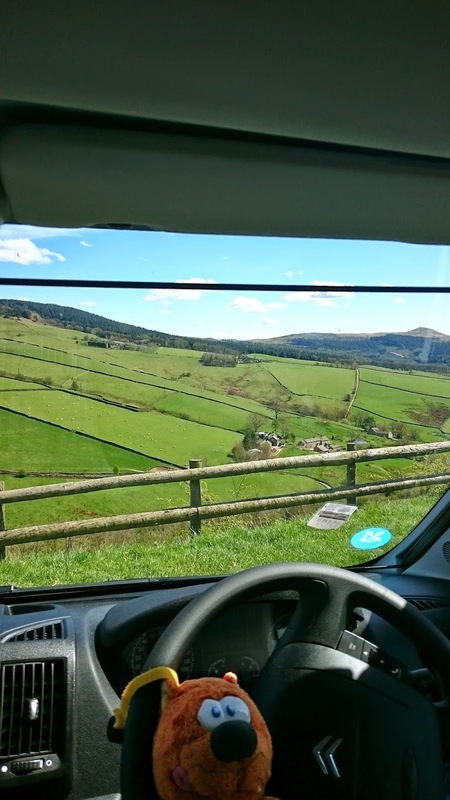 We left around midday and drove past Buxton to stop at Tegg's Nose country park. Parked up, we walked around and up the hill, looking at the panoramic 360' views. It was very sunny and clear, but chilly in the wind. Back at the van Cathy made lunch and we sat in the cab enjoying the view. Lunch view - who's that photo-bombing!? Back on the road, we were soon at home and spent a couple of hours emptying, cleaning El Nido (inside and out) and, finally, he got a name on his heart (or at least on his top rear end!). 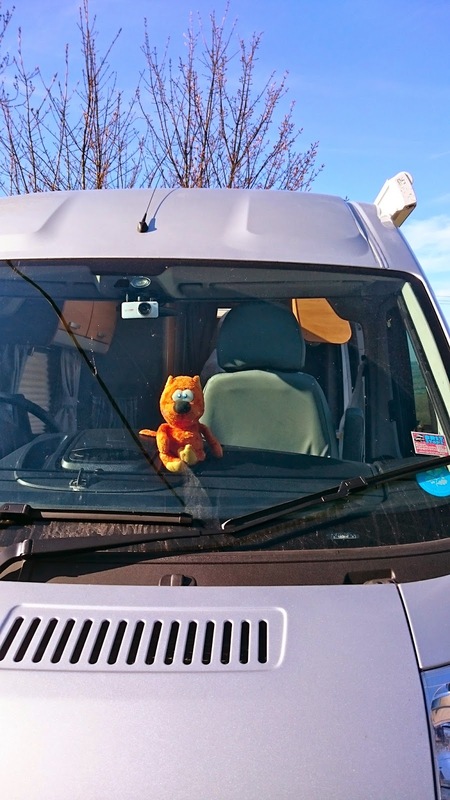 With Tiglet tucked up on the bench, I drove the van back to storage and so ended our first proper trip away. We started the long weekend with sorting out his furnishings and ended completely chilled, walking from the van and eating great food. We can't wait to head out on the road again. Well, today was a good day - Nido came home! It's been a long journey from delays, being ripped off, finding someone to fix it and starting the journey of two court cases, which remain ongoing. But after a few false starts he was ready for collection. I was home early from work and we went down to the unit at 1600. 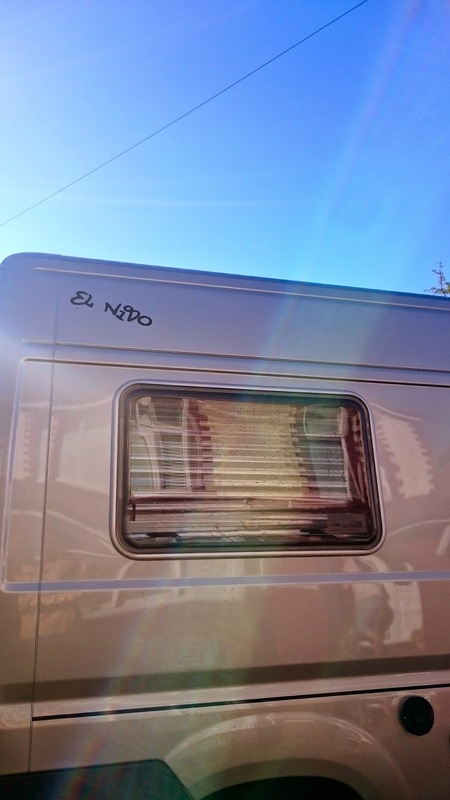 As we drove in we could see Nido outside - his awning was out and under was a table, two chairs, a bottle of Prosecco and two glasses! Roger and Gary met us and we knew it would be good as they were wearing beaming smiles. 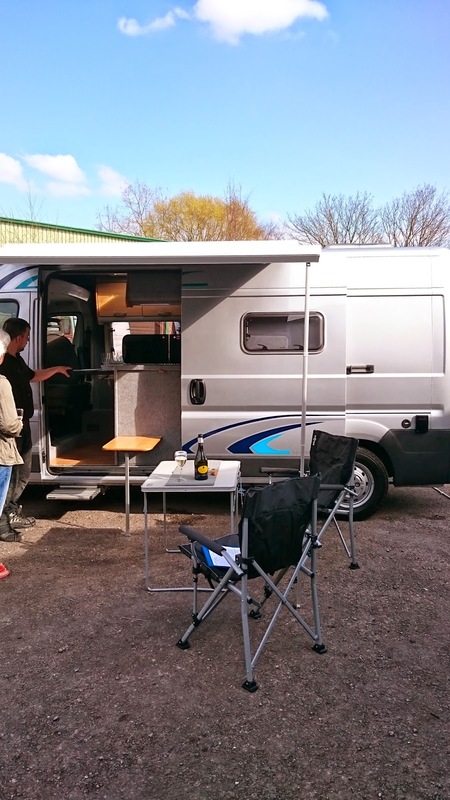 With a small glass of bubbly in hand, we inspected the outside of the van, including the garage area and everything within it. Inside the van they'd laid the table and, with EHU attached, Gary showed us how everything worked. The whole refit had been done really well and it showed in the quality of the work. We are really happy with it. Inspection done, I went in to pay up and talk to Roger about booking in for the last few jobs, including (most importantly of all!) fitting the bike rack. And with that we took El Nido home. Back at the house, the next couple of hours were spent bringing box after box of stuff down to load into the van. We didn't worry too much about where it went for now, as we knew it would take several reorganisations before we had everything where we wanted it. It had been a long day and much stress had been relived and relieved. 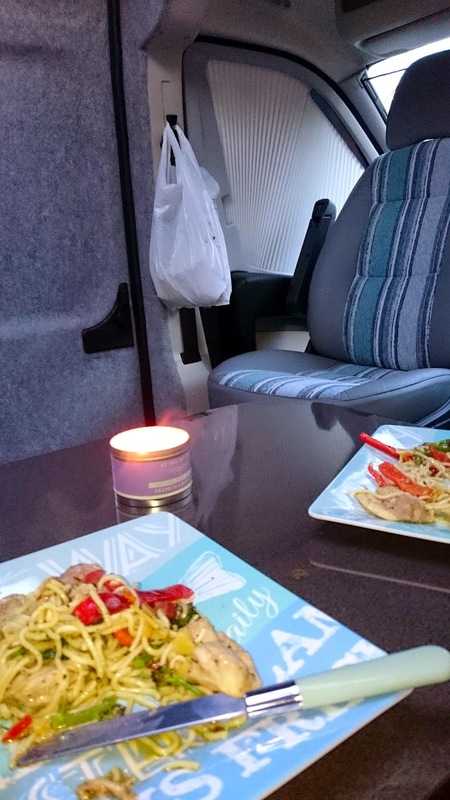 Van loaded up, at least as best we could, we cracked open a bottle of champagne, cooked a quick pasta meal and headed off to bed. We had a busy weekend ahead of us. We didn't sleep much last night - too excited I guess. 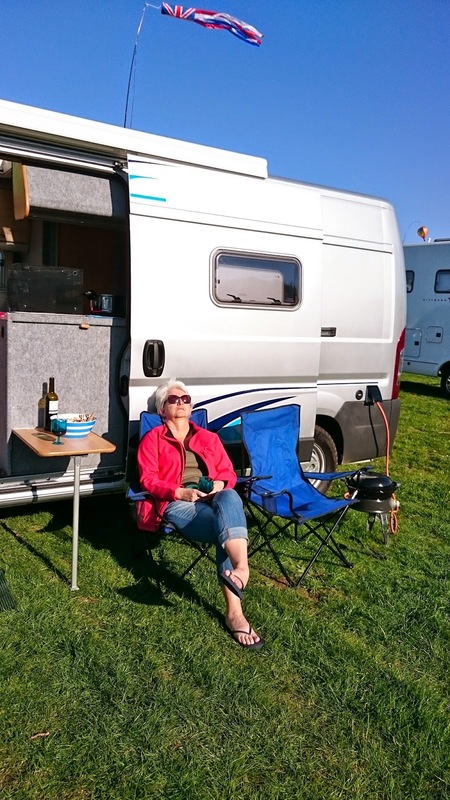 After breakfast we loaded up with clothes and food, checked everything was secured and headed off on our first proper trip in our very own campervan - off to meet Myrtle's Mates at the National Motorhome Show in Peterborough. 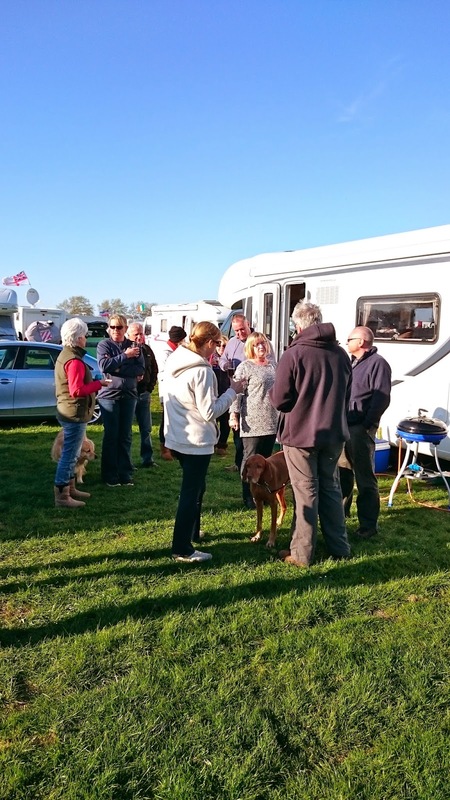 We arrived at about 1230 and, despite the efforts of the marshals who kept insisting we did circuits of the show ground, we turned into the MMMMU pitch and parked behind Nellie, Julie & Bob's campervan. Most people were already over at the show, although Christine, Alan and Maddy the Labrador were there so it was good to catch up with them. Eventually most of the gang returned and it was lovely to see them all and show them around Nido. After settling in and a brew we wandered off to take a look around the show. We had a shopping list of items and found most of these, plus some extras! Back at the van we had another sort out (I said we'd do this a few times! ), before fetched some fish and chips for our first proper meal in Nido. That evening we took our chairs and some booze across to the Myrtle Marquee. 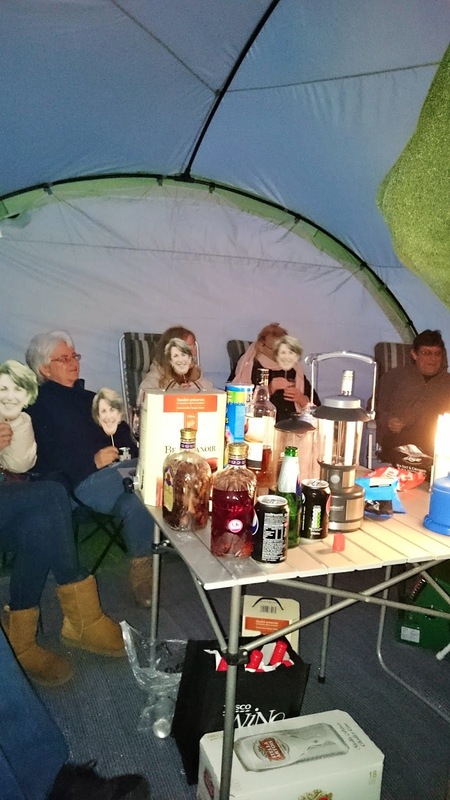 It was a cold and windy night but the banter and laughter was as good as always. 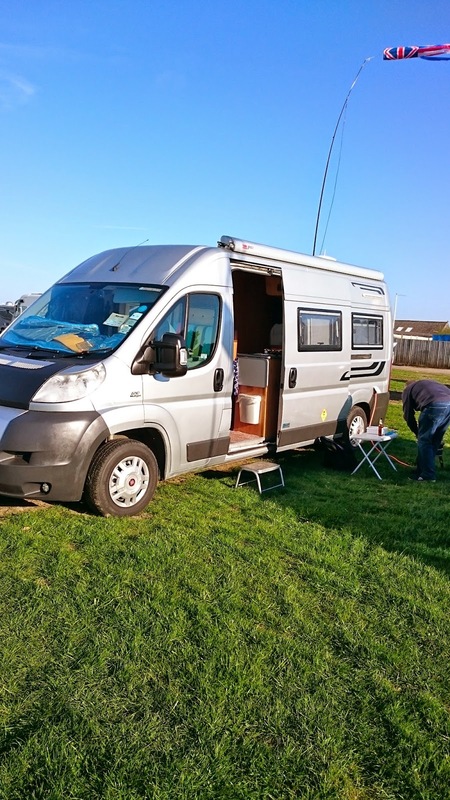 We also got to meet Ali & Mike Kingston, who have full-timed in their Citroen Relay for a few years and blogged about it on their very informative website. Ali has also written a couple of books about full-timing which I already had on my kindle. They had some interesting tales to tell. Cathy headed off quite early to bed as she was shattered and I followed about an hour or so later, ready for our first night sleeping in the van. We slept well, although it was a chilly night. 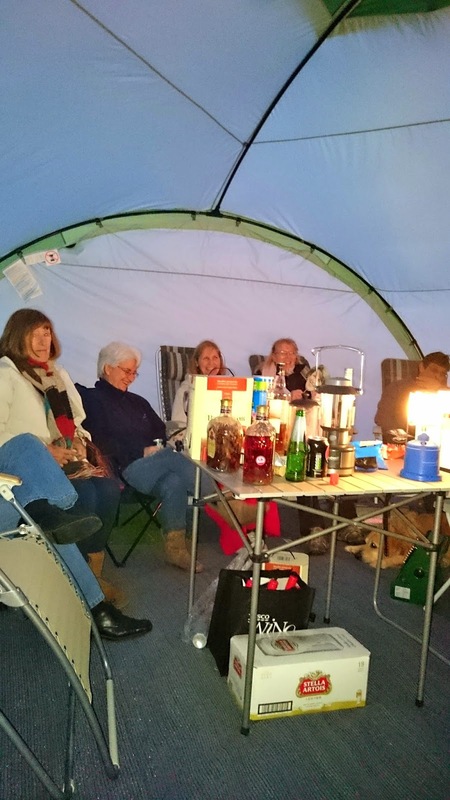 We were awake early and enjoyed a brew with the heating keeping us very warm and toasty. 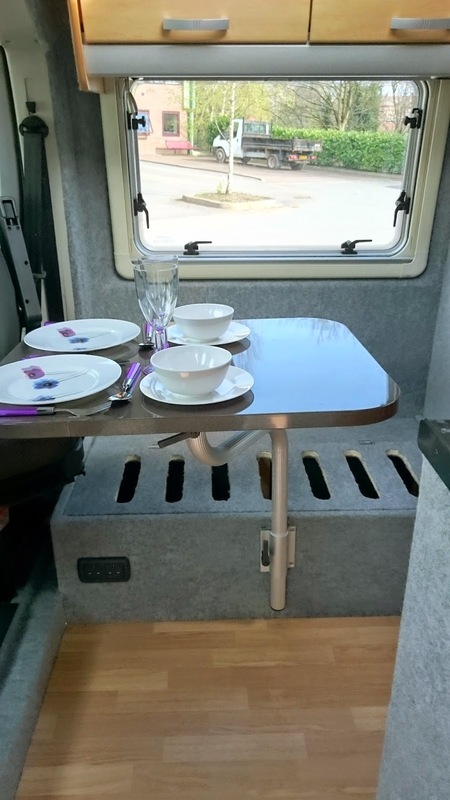 Breakfast was granola and we started to finally think that this was real - we had a campervan! It was a sunny day, clear blue skies, but with a strong, cold wind. Cathy christened the shower - lovely hot water! After breakfast we popped into the marquee for a catch up, before again heading out to look around the show. 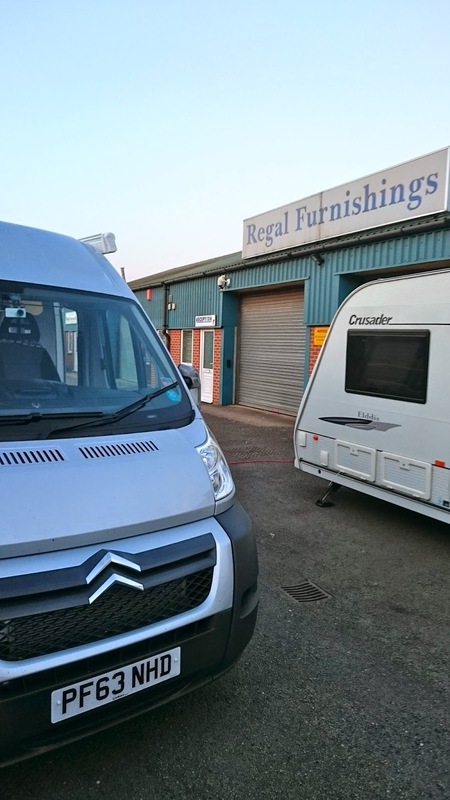 We popped over to the Regal Furnishings stand as we're booked in for next week to have cab seats covered, plus cushions and curtains made. Reading their pamphlet later, we realised we needed to pre-order the leather, so sould need to chat to them tomorrow. The rest of the day was taken up with prepping food for the MMMMU BBQ. This time I was cooking jerk pork loin with rice & peas. I'd prepared the jerk marinade at home and the pork was left to soak it up for the day. 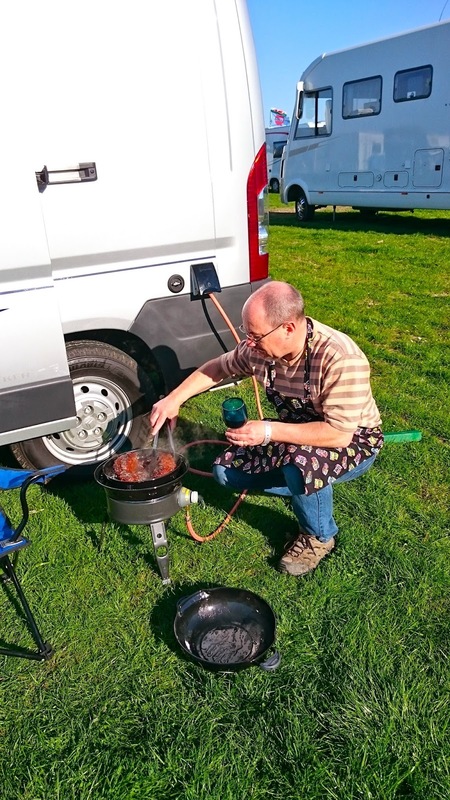 I was cooking this on the Cadac Safari gas BBQ, running off the external LPG point - another first in our new van! 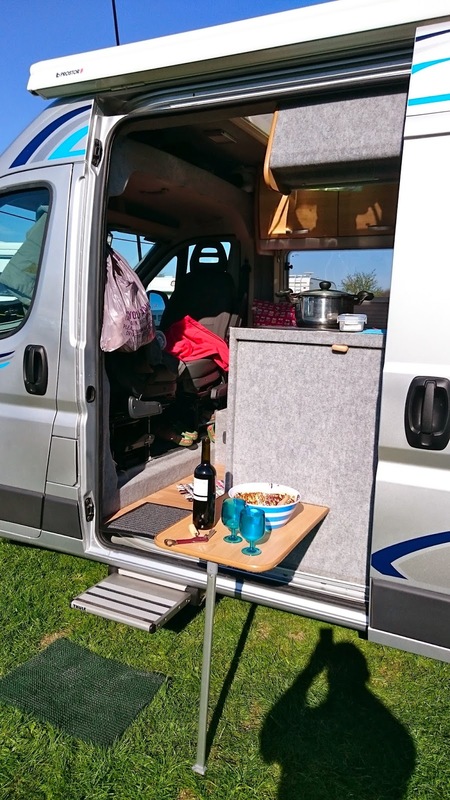 With it still blowing a hooley, we moved the van to provide more shelter, which allowed us to sit in the warm sun for a while with a glass of red wine. 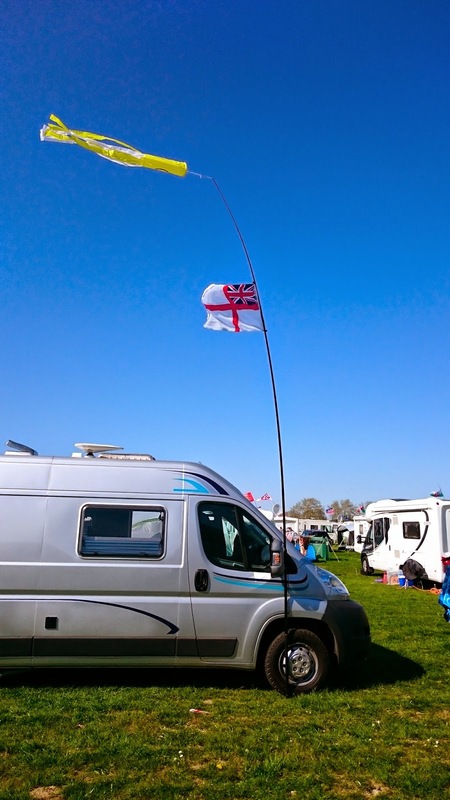 By now I'd set up the flagpole, with the smiley windsock plus a Royal Navy battle ensign! Cathy now wants an LED light to strap to the top! 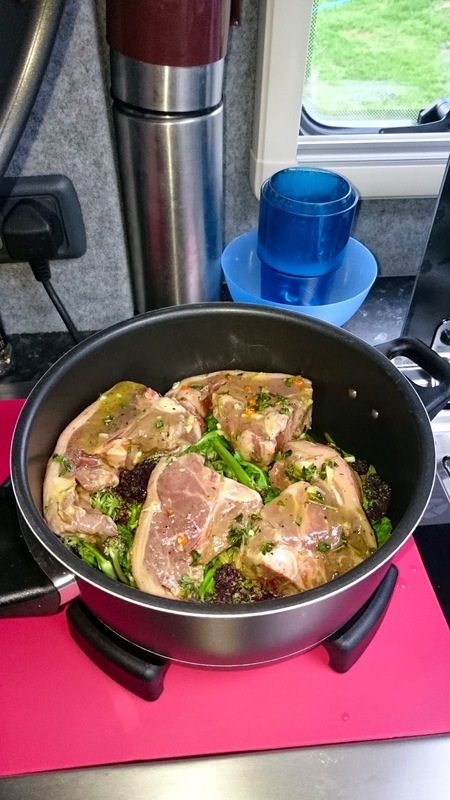 With the pork cooking and the rice & peas on the hob, we had a chat with the gang. The MMMMU official photo was taken outside Nido this year - a great honour! As usual there was plenty of lovely food, including some potent Reesies' garlic and paprika sausages! Tonight was much colder and we were all feeling it so, most people headed off to their vans quite early. In our case we had some hot chocolate before turning in. We kept the heating ticking over during the night, which kept us warm. 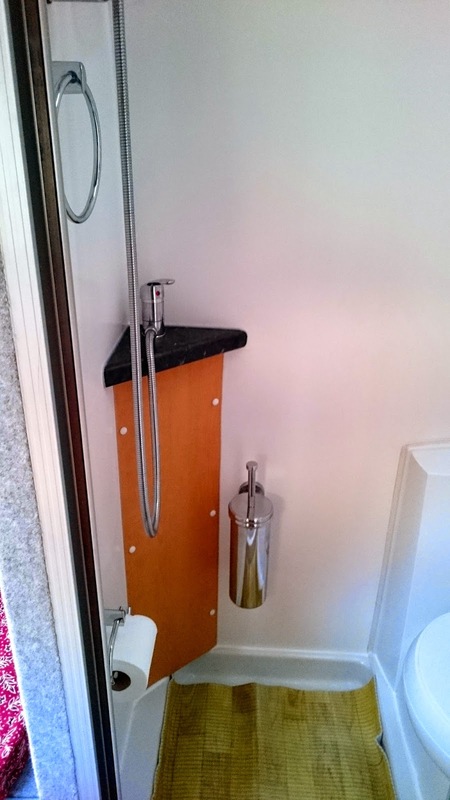 I had a shower this morning - hot water and a surprising amount of room in our small wet room. It truly is just right for us. 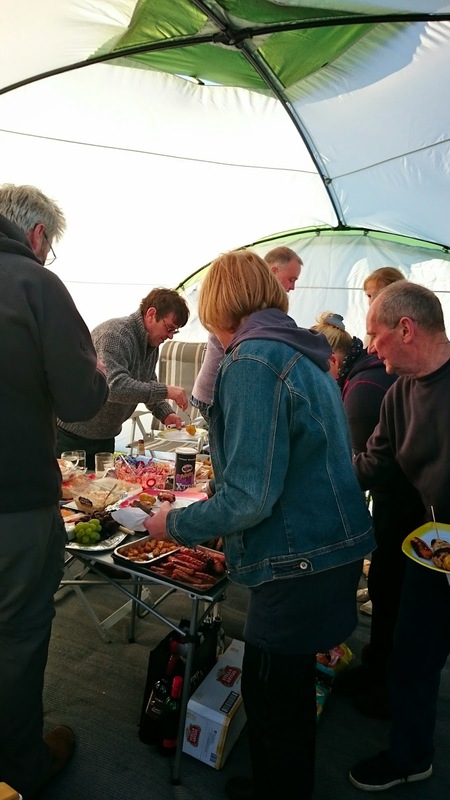 Breakfast was bacon butties cooked on the Cadac outside and taken into the marquee to chat to everyone. We stayed there for a while and I enjoyed some of the ground coffee brought by Julie & Bob. Gary & Julie had to leave early so after their goodbyes we went over to sort out the leather with Regal and have a last look around the show, finding a few useful items. 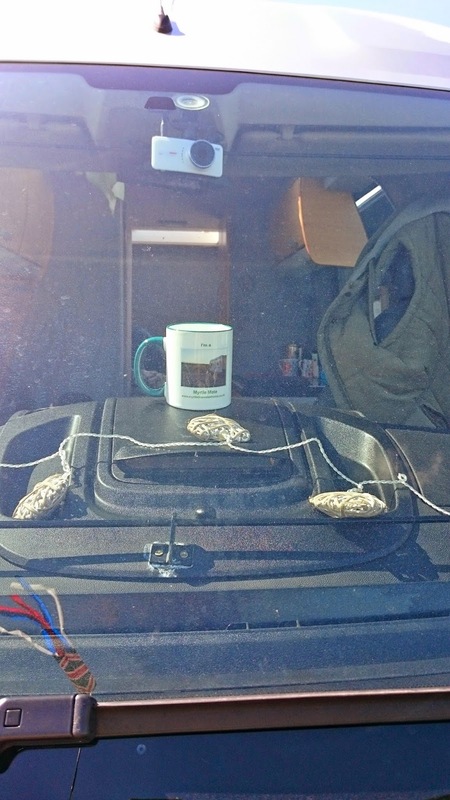 We bought a couple of hot pasties and took them back to the van for lunch with a brew. Then it was time to derig, secure for the journey home and say our goodbyes. We'd again had a great time and were already planning to meet up at with the gang again at the Malvern show in August. Waving as we left, we hit the road and decided to visit Mr T in Hemingford. We parked outside his flat and I made a brew as we caught up with each other's news. Then it was back on the road. Back home, we unpacked and drove the van back to the storage site for the first time since last September. We had a great weekend. 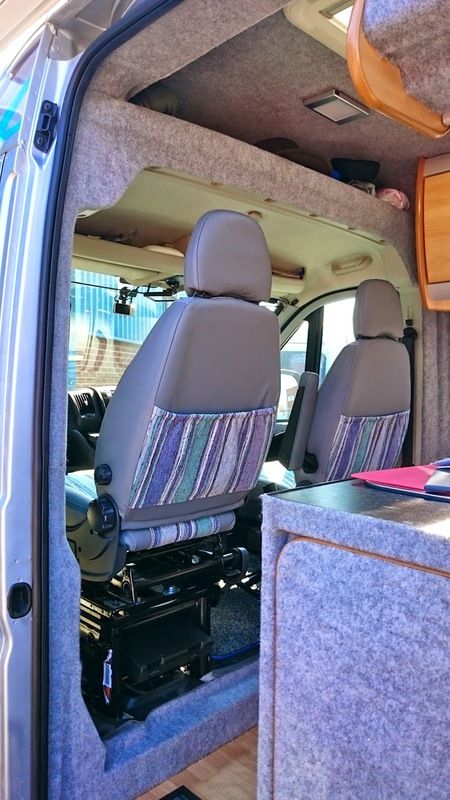 Finally having the van was hugely exciting and meeting up with friends made it all the better. The only thing that would have improved it would have been Steph, Ian and Marmite joining us - maybe next time. And so ended our first weekend away in El Nido - the first of many to come over the future years.